It has been an incredible week. We left the house on Monday morning, April 19, about 6:10 am. After a stop at the area office to get flu vaccines and another to get gas, we left Santiago with a friend on our first trip south to where the earthquake hit. Our friend needed a ride and we needed a guide so it was a great situation. The trip down was beautiful. We drove for 6 hours through beautiful fields of fruit trees, pine trees and vineyards. This is a huge agricultural area that provides much of the food imported to the U.S. in the winter as well as many other places in the world. The homes through this area are very modest—small , square, cement homes often with a corrugated metal roofs. It was interesting to see the damage from the earthquake. The metal roofs fared well—the tile roofs did not. We saw many roof tops with tiles thrown hither and thither. 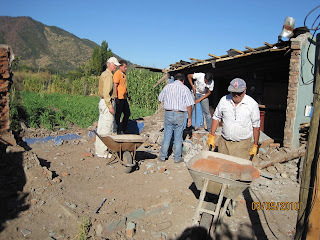 Adobe walls crumbled easily and many buildings are being used but have parts of walls crumbled badly. The freeways were a high priority for repairs and they were all open. However, many, many times we detoured to one side or the other because of fallen bridges or sunken roads. 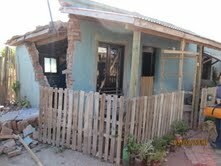 Once in the city of Concepción we were able to see a lot of damage but it was surprising how well many buildings fared. The building that houses the Concepción and Concepción Sur Missions is one of the nicest buildings in the city. It has a lot of small damage—tiles fallen off the walls, cracks in the walls, etc. The mission couples in both missions were living in the church with many of the missionaries and members for about four weeks while their apartments were being fixed. Pres. Swenson felt that the camaraderie they felt living together like that helped smooth over the trauma of the quake. Another church building was taken over by the police and they have no idea if they will ever get possession again. The police (the Carabineros) in Chile are not corrupt. The people speak highly of them and trust them. The soldiers who often act as police do not have the same good reputation. We shopped in a grocery store in Concepción which had some damage to one side of the building. People forced their way into this store and totally gutted it. It was not set on fire, however, as many were. The Swensons told us that after Haiti, many Chileans were quite vocal about the looting in Haiti and said that it would never happen in Chile. They were totally amazed when it happened on at least as grand of a scale. Everything was back to normal except the damage on the side, by the time we were shopping there. These are photos taken of a member's home and the work done to replace it. 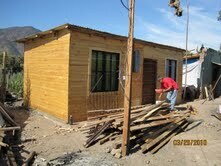 Many of the homes here are very small as you can see by the photos. We stayed at the Swenson’s apartment for two nights. It sits up on a steep hill overlooking the Rio Bio Bio. This river was the dividing line between the Spanish Chile and the indigenous tribe, the Mapuche, who were never conquered by the Spanish. The river is a wide, coastal waterway that joins the sea. It has several large bridges crossing it. One of these bridges fell like dominoes falling one against another. It has not been repaired and neither has another large bridge that looks okay from a distance but probably is irreparable. The Mission Pres. lives on the north side of the river but almost all of his mission is located on the other side. It has made it very difficult for his missionaries. Travel time is still very long since only one of the main bridges is open and functioning. It was especially difficult for Pres. and Sis. 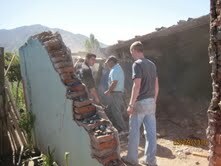 Swenson to check on their missionaries as they could not access the other side for several days after the earthquake. Almost all cell phone communication was down, also. Driving around, it is the rule, rather than the exception, to see sunken or raised areas. Roads dropped several feet or had been raised up several feet from the adjacent ground. The city of Concepción moved ten feet. There are multiple tremors every day but they said that at first the ground was in almost constant motion. Inside the city, the repairs have come much more slowly. The apartment building that tipped over is still just the same. There is disruption everywhere in the roads where they have had to make entries to repair infrastructure under the roads or where sections of roads have collapsed. Life is going on, though, almost as if nothing had happened. The Swenson told us of the many rumors that circulated, further frightening the people. One widely held rumor was that the U.S. had a machine that could cause earthquakes and it had caused both this one and the one in Haiti. There was a rumor that 2,000 men were on their way to Concepción to destroy the people. She had a collection of about 20 rumors. Most of the missionaries were aware of these rumors. The fear caused by the rumors was at least as bad as the fear of the earthquake. Sis. Swenson talked in the zone conferences about fear and how it is a tool of Satan. It pushes out faith and therefore removes us farther from the spirit. We taught about the Ten Commandments of Good Health at three different Zone Conferences and had a great experience with this. We also gave about 160 flu shots and Dave saw about 50 sick missionaries during these conferences. We traveled with the Swensons and just had the greatest time. Being with that many missionaries is an amazing experience. They have had, and continue to have, many opportunities for service. 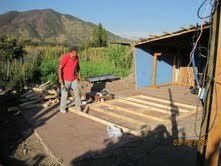 Frequently they are helping to tear down a house or repair a house and that has been a positive thing for them. The missionaries in the south all want to be transferred to the north so they can help. 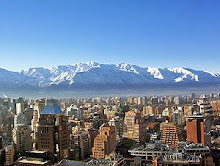 The last conference was far south in Temuco, which had almost no consequences from the earthquake. Temuco used to be in the Osorno mission before the Concepción Sur Mission was split off from Concepción, and it is quite chilly there. I think that the temperature in the church was about 48 or 50. It is very green and beautiful. The trip home from there took us ten hours, driving on freeway the entire time. Wood is a huge industry there in central Chile. They grow much pine and eucalyptus. Huge areas are planted to trees which are in various stages of growth from acres of saplings, to huge trees, to bare ground where trees were harvested. Large processing plants are frequent. Because of the economy, the industry was down to about 20% of normal but now it is up and running with gusto. We had no time to take photos on the trip but I hope to get some to posted in the next few days.